We see many friends running businesses that are regenerative for the soil and the crops, but rely on extractive time, labor, and mental health. You are not an inexhaustible resource. A business that runs on you and your partners alone is not regenerative. It is extractive, no matter how good the soil looks. As a business owner, I know that it is much harder to live these words in action. I offer these words to co-ruminate on as we work towards building better businesses. Let's wean ourselves off of this narrative for "what it takes" to be a rancher, a farmer, an entrepreneur. We should not aspire to backbreaking labor, endless hours, below-minimum wage, and degrading health. A regenerative business should feed you more energy than you take. One of the most powerful lessons of Holistic Management and Ranching for Profit: put yourself in the equation. A business that runs on an extractive lifestyle from its owner isn't a regenerative one. An always-on sacrificial mindset is damaging to us and to the movement. This may be the hardest lesson that I am learning and continue to learn. Human soil building doesn't look like all-growth-all-the-time. Full recovery and rest for all members of the business is productive. Before you can grow your land's carrying capacity, you need to invest in your soil. The same is true for human carrying capacity. We can't double or triple output by sheer toughness - not forever. I've started calling deep rest and recovery periods my "growing down" periods. Roots grow down beneath the visible surface. What looks dormant may be taking root. If we are perennials taking root, what do we need to thrive? Let's cultivate biodiversity in our relationships across our “people food web”. I wish there were more random people in the regenerative movement! I wish we didn't yet know what their function was, like microbes. Let's expand our social soil aggregates. Let's build pathways to nurture each other. What intellectual polyculture looks like: Our speakers at The Grassfed Exchange: Regeneration Rising 2019. Creates more value outside the ecosystem than it captures for itself. Puts out energy into surrounding community. Promotes a vibrant, diverse ecosystem. The goal is to help the entire ecosystem thrive and grow to the next level. It is not a single-company land grab or a monoculture. It wants to accelerates the growth of other life in the system. It does not try to squash new life. Embraces change and transformation as part of the natural life cycle. A company may re-seed in unexpected ways, or get composted into a new form altogether. It composts failures and invests in postmortem processes that turn sh*t into gold. Imagines radically new relationships. If we're not actively healing extractive relationships and systems between people, health, capital, and land, we're still trapped by the status quo. How does a regenerative mindset translate into what we do? Be part of the social "glue": Holistic Management International, Savory Institute, Ranching for Profit, Stockman Grass Farmer, On Pasture, Point Blue Conservation Science, Grassfed Exchange, Quivira Coalition, American Grassfed Association, The Herd, and others. We are part of these communities, and with my volunteer time I'm happily co-chairing the Grassfed Exchange 2019: Regeneration Rising. We take an abundance mindset, not a scarcity mindset, to other companies driving innovation in our space. I would love to see 10x more tech companies in our space. We want a future abundance of tech tools that make farmers better, not one winner-take-all. A thriving ecosystem and interconnected data will take us to futures we can't yet imagine now. We celebrate other players building data and technology for the regenerative movement: FarmOS, Savory Land2Market, Soil Carbon Coalition, Yale UCross Center, Vence, Agersens, HerdDogg, Maia Grazing, FarmIQ, Agriwebb, LandStream, TerrAvion are all moving the industry forward. I’m glad that they are part of the movement. I have open invitations to ag tech founders to grab coffee or calls on how we can support each other. Create spaces for growth. Soil can't infiltrate and support new life without pore space. Accelerate the next generation of regenerative farmers and ranchers. 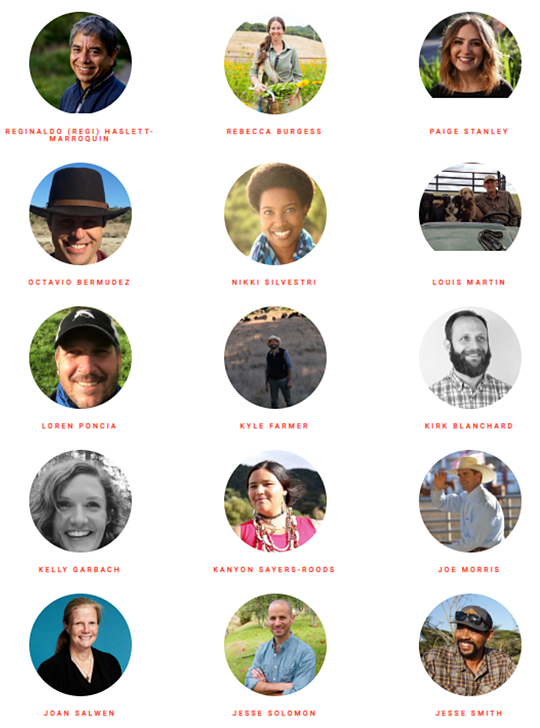 Our podcast collaboration with Grassfed Exchange and Quivira Coalition, Regeneration Rising, spotlights next generation regenerative business leaders. Promote intellectual diversity by cultivating it ourselves. We intentionally build our processes for diverse perspectives and culture of safety to disagree. Our intellectual polyculture is our greatest strength. Compost your failures. This year, we made hard decisions that reduced diversity on the team. I struggled with burnout. We also haven't made as much progress as I would like on ecological incentives that reward farmers. We embrace failure to learn from our messes. Then we roll up our sleeves and get dirty. The future belongs to ecosystems of regenerative businesses. We are in the beginning of a cresting wave to a better equilibrium. The benefits of technology should open to many, not gated by the few. Successful businesses should be connected, open, and sharing. Most of the tech we use was not intended to concentrate power and influence in fewer hands. We need to imagine radically new relationships between users and their data, between tech companies and farmers and consumers. And ditch those labels altogether. There's nothing to fear about putting energy outwards to feed others. It's not a zero sum game. Because soil grows up. When we make space in our social soil, we rise. See you at Regeneration Rising in Santa Rosa!